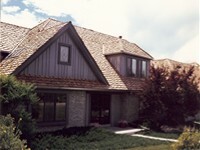 There are many areas of the roof where problems can occur. The choice of the material used in these problem roof areas as well as their proper installation can greatly mitigate the damage that they cause. Other problems also sometimes exist that are roof related such as with the design of the roof or part of the building, with the exterior wall covering, with the plumbing, heating, mechanical, and air vents, etc. In this section of our website we will not only point out some of these problem roof areas but provide solutions. We will be adding new content pages that address other roof problem areas as time goes on and we will update the information on the existing web pages if anything changes. Here you will find answers to your questions and solutions to your roofing problems by clicking on the links below. To many, hearing or seeing these words brings thoughts of a lot of $$$$ coming in or going out, not to mention the major headaches hail creates for everyone involved. Many so called roofers and Roofing Contractors swarm to hail damaged roof areas like bees right after a hailstorm occurs. A few are okay, but many are not so good and some are really bad. Find information here about ice damming along the eaves, why it happens and what damage occurs and solutions to solving this problem. This web page points out the problems in the way roofers find the roof framing, roof decking, and trim fascia intersecting. Eaves, the area where water is shed off the roof slope can be a problem if roofing materials and accessories are not properly installed. Many times, however, the proper installation of roofing materials and accessories is thwarted because the substrate materials are not properly installed.